Sony's Jumanji: Welcome to the Jungle has dominated at the box office all month long, but, as expected, its reign came to an end this weekend, thanks to 20th Century Fox's The Maze Runner: The Death Cure. While it came in slightly under projections, the third installment in The Maze Runner trilogy based on the books by author James Dashner, took in an estimated $23.5 million, more than enough to take down Jumanji: Welcome to the Jungle, which is still putting up strong numbers in its sixth frame in theaters, dropping just 15.9% to take in $16.4 million. The Maze Runner: The Death Cure opened in 3,787 theaters, posting a solid $6,205 per-screen average. This movie continues the downward trend for this franchise, as the trilogy comes to an end. 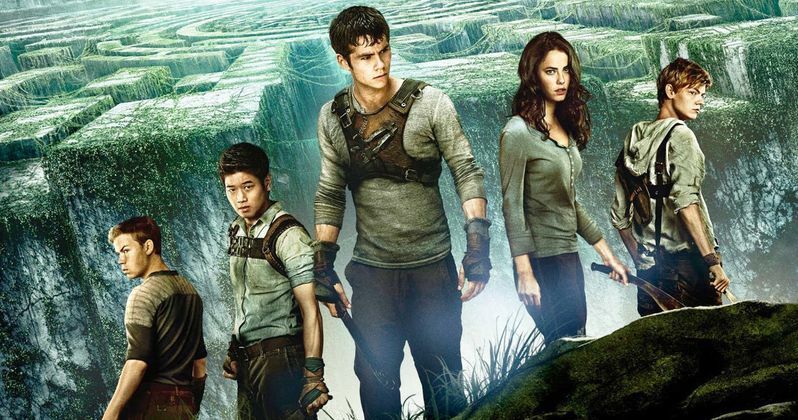 The Maze Runner opened in 2014, debuting with a $32.5 million opening weekend, with $102.4 million domestic and $348.3 million worldwide, from just a $34 million budget. The 2015 follow-up The Maze Runner: The Scorch Trials dipped slightly, opening with $30.3 million en route to $81.6 million domestic and $312.3 million worldwide, from a $61 million budget. This movie was actually delayed quite a bit, after a horrific injury to star Dylan O'Brien on the set. Production was shut down in March after Dylan O'Brien suffered serious injuries on the set after a motorcycle stunt went wrong. While filming was originally supposed to resume just a few weeks later, the production was shut down for several months to give the star more time to heal from his injuries. The release date was pushed back by a full year, jumping around on a few dates in early 2018 before settling on the January 26, 2018 date. That move seems to have paid off, with a solid box office win, even though the movie came in under projections and continued the trilogy's downward trend. Still, with a $62 million production budget, this finale should manage to make a solid profit for 20th Century Fox. In the epic finale to the Maze Runner saga, Thomas leads his group of escaped Gladers on their final and most dangerous mission yet. To save their friends, they must break into the legendary Last City, a WCKD-controlled labyrinth that may turn out to be the deadliest maze of all. Anyone who makes it out alive will get answers to the questions the Gladers have been asking since they first arrived in the maze. Dylan O'Brien leads the cast of this franchise finale alongside Kaya Scodelario, Nathalie Emmanuel, Katherine McNamara, Walton Goggins, Thomas Brodie-Sangster, Rosa Salazar, Giancarlo Esposito, Barry Pepper and Patricia Clarkson. Wes Ball directs from an adapted screenplay by T.S. Nowlin. Jumanji: Welcome to the Jungle, starring Dwayne "The Rock" Johnson, drops to second place with $16.4 million, bringing its impressive total to $338 million domestic and $822 million worldwide, from just a $90 million budget. The top 10 is rounded out by Hostiles ($10.2 million), The Greatest Showman ($9.5 million), The Post ($8.8 million), 12 Strong ($8.6 million), Den of Thieves ($8.3 million), The Shape of Water ($5.7 million), Paddington 2 ($5.5 million) and Padmaavat ($4.2 million). Also opening in limited release is Parade Deck Films' Desolation, which earned $10,640 from two theaters for a $5,320 per-screen average. No box office data was given for Reliance Entertainment's Aiyaary, Strand's Have a Nice Day, Well Go USA's Kickboxer Retaliation, Vertical Entertainment's The Neighbor and Sony's Pad Man. Only one new movie opens in wide release next weekend, Lionsgate's Winchester: The House that Ghosts Built, starring Helen Mirren, although there are also a number of movies debuted in limited release. Vertical Entertainment's Bilal: A New Breed of Hero, IFC's Cage Fighter, Sony Pictures Classics' A Fantastic Woman and Cinedigm Entertainment's Scorched Earth will all debut next weekend in a platform release although no theater count details were given. Take a the box office estimates, courtesy of Box Office Mojo, and check back Tuesday for next weekend's predictions. Can Winchester Shoot Down Maze Runner 3 at the Box Office? Can Maze Runner 3 Outrun Jumanji at the Box Office?